Chief Architect is a 3D architectural software for designing highly detailed plans for homes and light commercial buildings. It enables you to focus on manipulating rather than on modeling, as it smartly generates 3D renditions as you draw walls and place objects about. Beyond designing tools and features, Chief Architect also helps you produce a materials list as you design. This saves you time for your presentation as you have the list of required items ready. Thus, your clients can quickly decide whether to go through with the plan or to modify it to fit their budget. Additionally, Chief Architect has a mobile 3D viewer that you can download for your iOS or Android device. This enables you to export 3D plans and embed them to your website as well as view and share models on the go. 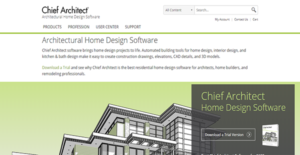 Chief Architect is equipped with powerful building and designing tools that enable you to draw up plans swiftly. Despite the speed in which it allows you to work, the software also ensures that you create according to standard building processes. Together, the two features make your workflow more efficient. One of Chief Architect’s key features is its smart design objects. These are articles that you can mold into different configurations are based on actual products by manufacturers. Because of these, the software can render details accurately for you to make your design immersive and engaging for your client. As you create, Chief Architect automatically transforms walls and other features into 3D objects. On top of that, the software enables you to switch between 2D and 3D modeling and editing. As such, you can make your home and commercial building schemes more vivid. Though Chief Architect is focused on providing you with robust architectural design tools, it also offers you a powerful CAD engine. With this, you can manipulate objects rapidly, read AutoCAD files, and generate custom CAD minutiae. While 3D renderings and virtual tours assist you in marketing your design, construction drawings aid you in building the actual product. Chief Architect affords you with the tools for generating multiple views of your project—from floor plans and framing to section details and elevations. With these, you have full control over the layers that help in the building of a home or light commercial space. The house or the building itself is not the only thing that Chief Architect is concerned with. It also gives attention to your need to define the site and conceive of a perfect accompanying landscape. That is why the software empowers you to add and define details in the exterior and surrounding space to complete your plan. If you are interested in Chief Architect it might also be a good idea to analyze other subcategories of Best Architecture Software collected in our base of B2B software reviews. Each company has its own characteristics, and can need a particular type of Architecture Software solution that will be fit for their business size, type of customers and staff and even individual industry they cater to. We advise you don't count on getting a perfect solution that will be suitable for each business no matter what their background is. It may be a good idea to read a few Chief Architect reviews first and even then you should remember what the solution is supposed to do for your company and your staff. Do you need an easy and straightforward app with just elementary features? Will you really make use of the advanced tools needed by experts and large enterprises? Are there any specific features that are especially useful for the industry you work in? If you ask yourself these questions it will be much easier to locate a trustworthy solution that will match your budget. How Much Does Chief Architect Cost? We realize that when you make a decision to buy Architecture Software it’s important not only to see how experts evaluate it in their reviews, but also to find out if the real people and companies that buy it are actually satisfied with the product. That’s why we’ve created our behavior-based Customer Satisfaction Algorithm™ that gathers customer reviews, comments and Chief Architect reviews across a wide range of social media sites. The data is then presented in an easy to digest form showing how many people had positive and negative experience with Chief Architect. With that information at hand you should be equipped to make an informed buying decision that you won’t regret. What are Chief Architect pricing details? What integrations are available for Chief Architect?